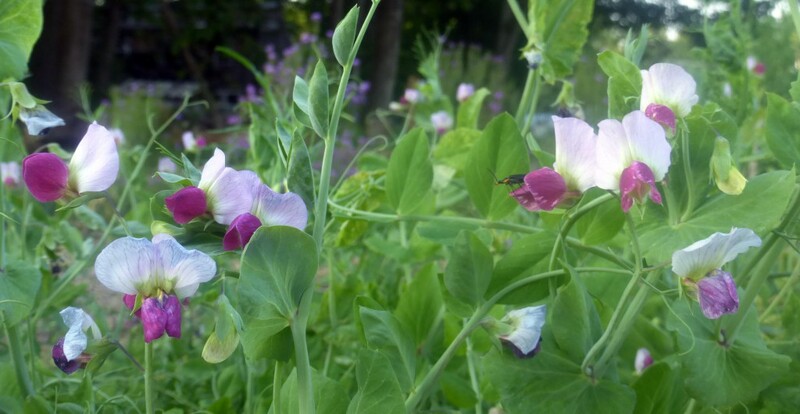 Last fall I scattered Austrian Winter Pea seeds over several of the small beds in the herb garden next to our office, and lightly raked them in. For the past couple of weeks, every other day or so I pinch off a few of their small shoots as I walk from the house to the office and back. Like many children, I relish the ability to eat vegetables right in the garden, within a few moments of picking them. At this time of year, I cherish the diversity Austrian Winter Peas add to the range of very fresh food I can eat. Yesterday I brought some pea shoots to Penny and her mother Scarlet, and then I brought Penny and Scarlet to the Austrian Winter Peas. 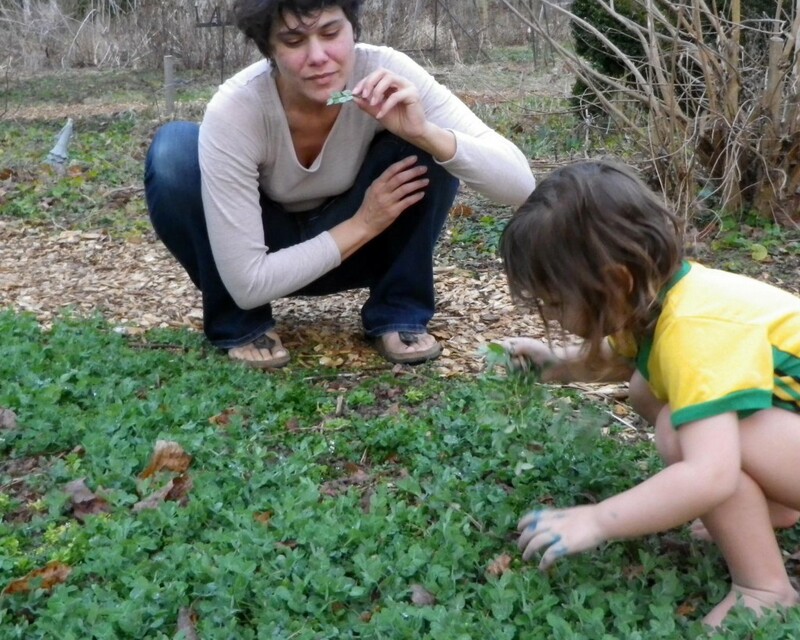 Penny devoured them, and Scarlet said that one of her favorite memories of her own childhood was of eating peas and pea shoots in her neighbor’s garden in British Columbia. 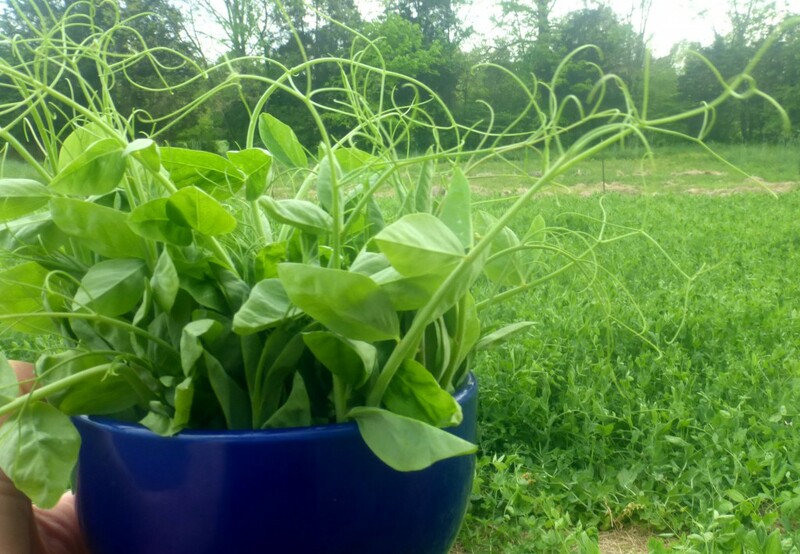 In a few weeks I’ll be frequently snipping off a bowlful at a time of large, lush shoots, adding them to salads and stir-fries, as well as snacking on them. 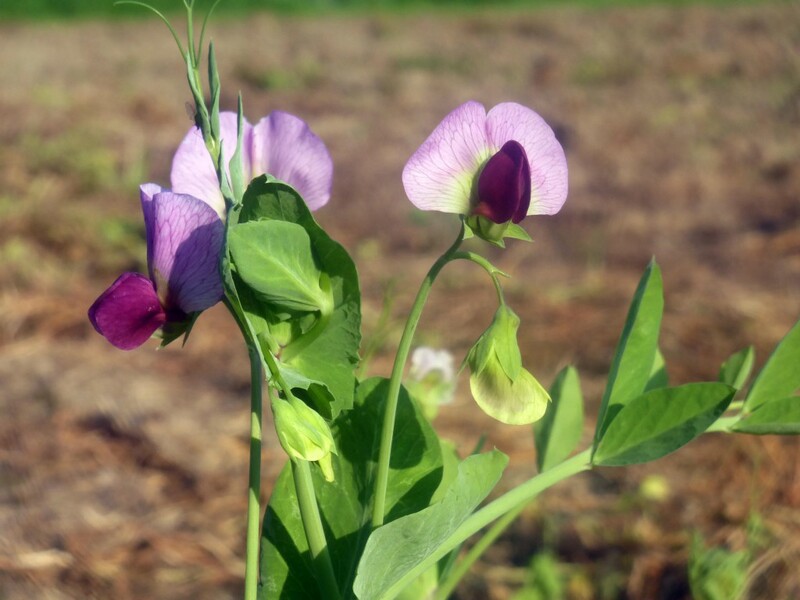 Like other legumes, these peas form relationships with rhizobial bacteria in the soil that pull nitrogen out of the air and make it available both to the pea plants themselves, and to the next crop we plant in these beds. 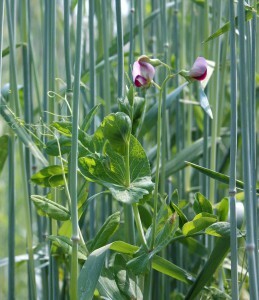 Austrian Winter Peas are more frequently planted as a cover crop than for eating. Our half-pound package is appropriate as a cover crop for small gardens, and as food crop for gardens, homesteads, and other small farms. For maximum nitrogen fixation, we could decide to till these peas under shortly after they start to flower. Or, we could leave them a little longer to enjoy the two-tone purple edible flowers. I wish I was a better record-keeper and could tell you what day I planted this small crop of Austrian Peas. The best time is 4-6 weeks before your first fall frost, but I planted well past that date. Even planting them now would yield some benefit in our climate, and in colder parts of the country, Austrian Winter Peas are generally spring-planted as soon as the soil can be worked. They can take lower temperatures than other peas, even a little below 0°F for short periods, but if you plant them in fall in zone 7 or colder, you might want to mix the seed with rye to shelter the pea plants through the winter.